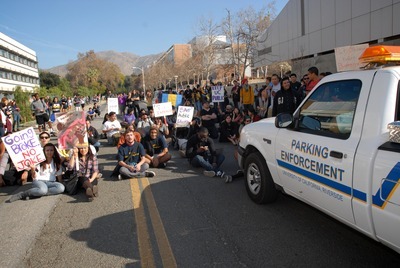 RIVERSIDE, Calif. (www.ucr.edu) –- UC Riverside police detained three people during protests Thursday, Jan. 19, outside the UC Board of Regents meeting taking place on campus. One protester was released without charge. Two were arrested and booked on suspicion of felony assault on a police officer: Kenneth Ehrlich, 39, of Los Angeles, and Humberto Rivera, 25, of Corona. 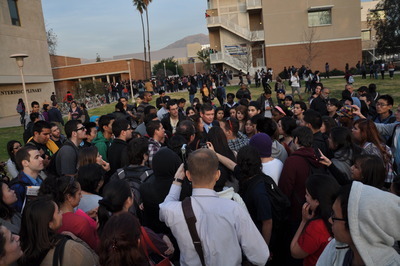 UCR Chief of Police Mike Lane estimated the number of protesters at between 300 and 500 people, but the crowds were difficult to estimate because a number of students were observing and following but not actively participating. 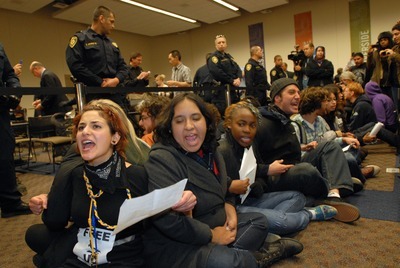 After protesters blocked entrances to the meeting, police issued several orders for the crowd to disperse. Elsewhere, a UCR police officer fired pellets toward protesters who were trying to break through police lines. These are hard plastic pellets that are similar in force to a paintball. 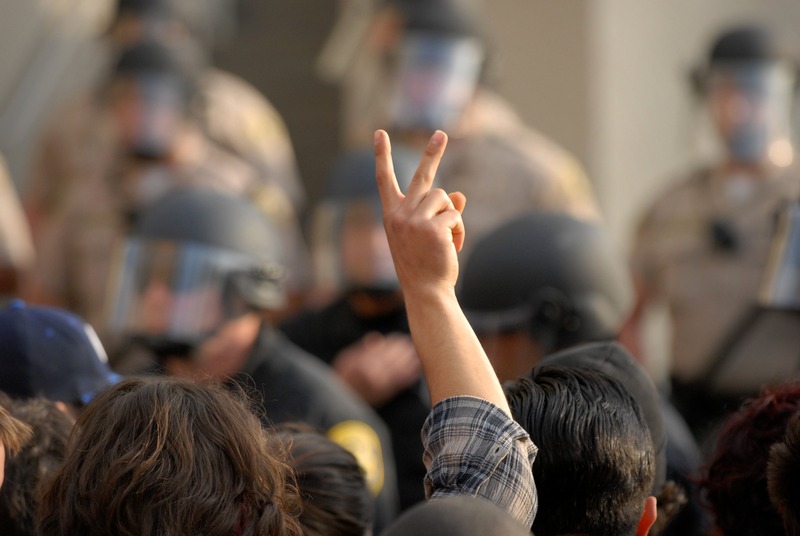 Officers from the University of California Police Department (UCPD) used batons at different times and locations in response to aggressive action by the protesters. The department is attempting to identify and contact anyone who was injured. “The protesters picked up a metal barricade and began advancing through the crowd and toward officers,” Lane said. Fearing that the barricade was going to be thrown, or used as a weapon, police deployed the air-propelled pellets. Lane said that incident was the only time that police deployed pellets. Regents meetings have been frequently disrupted by protests in the past. At the start of the two-day meeting, 105 sworn UC police officers were on campus. “On the second day, as the crowd grew and began physically confronting officers, we initiated our mutual aid response protocol and got 40 officers from Riverside Police, and 50 deputies from the Riverside County Sheriff’s Department,” Lane said. Nine UC police officers sustained injuries, including bruises, cuts, and scratches. None required major medical attention. Lane said protesters picked up metal barricades and used them to block access to the roadway, refusing to allow vehicles to leave from a parking lot. At one point university vehicles carrying UC administrators and employees were surrounded by protesters. Police responded and after about 40 minutes, the vehicles were allowed to leave. Inside the Regents meeting earlier in the day, a planned public comment session was extended. But at the point that Regents had given all who had signed up a chance to speak and they wanted to start the business part of the open public meeting, protesters demanded that they be allowed to keep speaking. Police cleared the room of the public, except for 15 to 18 people who sat down, locked arms and were engaged in peaceful civil disobedience. “Chancellor White and other UC leaders talked with them, and they decided to leave peacefully,” Lane said. In a letter to the campus community on Friday, UCR Chancellor Timothy P. White said, “The students have legitimate concerns about affordability and access to UC, as well as the quality of their educational experience. I share their deep concern and worry, and I along with so many others, am working daily to help find solutions.” He said he appreciated the restraint shown by the students, the police and by the regents in the face of a difficult situation. He also offered kudos for the hard work of the staff who organized every detail of food, transportation, facilities, safety and communications. After public comment time ended, protesters declined to let the meeting continue. They linked arms. After about 50 minutes they left the room peacefully. 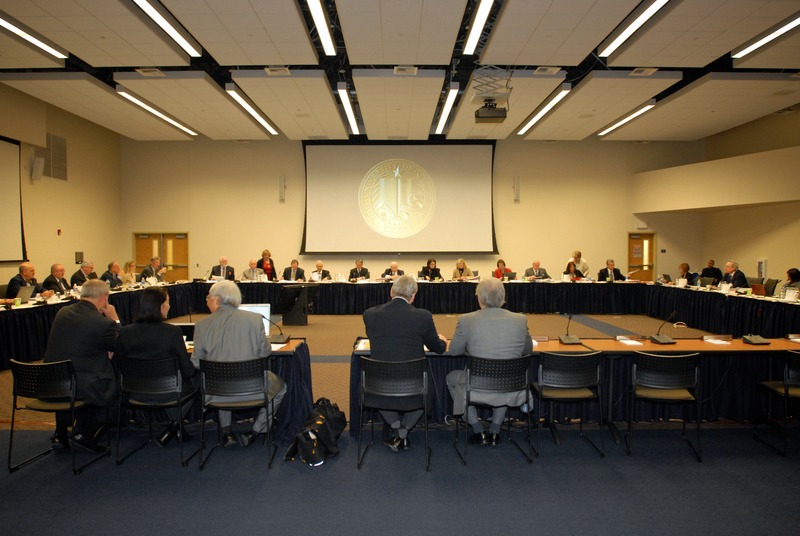 Regents continued their meeting with only journalists present. Photo credit: Carrie Rosema. Chancellor Timothy P. White engaged in conversations throughout the day, asking for individual student stories he can use as he lobbies state lawmakers and private donors for more funding and support for scholarships. Photo credit: Sean Nealon. 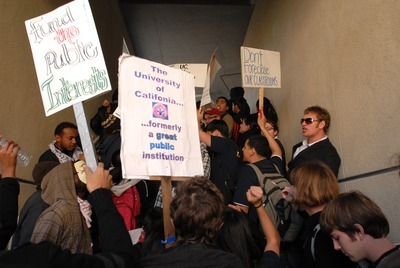 Protesters blocked exits to try to prevent the Regents from leaving. Photo by Carrie Rosema.